This powerful product kills almost all annual and perennial weeds, grasses and other unwanted plants. Simply mix it with water and use to control unwanted growth around landscaping, walkways and driveways, for lawn restoration or renovation, for garden plot preparation, for brush and vine control and even as a stump treatment. If you are looking for 41% glyphosate for Roundup® Ready crops, refer to the 41% Glyphosate Plus Surfactant label and SDS. General Weed Control: Use along fences, paths, patios, sidewalks, driveways and in brick and gravel walkways, around trees, shrubs, ornamental plantings and flower beds, and around buildings. Use to trim and edge landscape areas. For a complete list of species controlled, see the COMPLETE LABEL. Spot Spraying: Use on actively growing weeds in and around flower beds, ornamental trees, fruit and nut trees, grapevines, shrubs, fences, driveways and walkways. Make sure Concentrate Grass & Weed Killer 41% Glyphosate does not contact the leaves, green stems or exposed roots of plants you don’t want to kill. Concentrate Grass & Weed Killer 41% Glyphosate will not move in or on the soil to untreated plants. If used to control weeds around fruit or nut trees or grapevines, allow 21 days before eating the fruit or nuts. Landscaping: Use to prepare areas for planting of ornamentals, trees, shrubs, desert landscapes, rock gardens, flower beds or similar plantings. Treated areas can be replanted 1 day after treatment. Lawn Renovation: Use to kill existing weeds and grasses including the old lawn. For best results, apply in spring or fall, when daytime temperatures are at least 60 °F. See label for complete lawn renovation instructions. Brush Control: Use when brush is green and growing. If plants are taller than 5 feet, cut back and spray regrowth. Brush sprayed in the fall may not be fully controlled until the following season. Hard-to-control species such as blackberry, kudzu or poison oak may require a second application. Stump Treatment: Stumps can be treated to prevent regrowth. For best results, treat when the vegetation is actively growing and within 5 minutes of being cut down. See label for further instructions. Treatment will control or suppress many types of woody brush and trees, such as alder, bluegum, eucalyptus, madrone, oak, giant reed, saltcedar, sweetgum and tan oak. If vine is growing up a pole, fences, or mature tree trunk, cut vine to a height of 3 to 4 feet and spray to thoroughly cover remaining vine. If vine is climbing a shrub or immature (green) tree trunk, cut vines at base and spray its regrowth. Shield shrubs and green bark from spray drift with a sheet of cardboard or plastic. Use any time weeds are actively growing. Most treated weeds show initial symptoms in 2 to 4 days and complete kill in 1 to 2 weeks. Larger more established weeds may take up to 4 weeks for complete kill. For best results, apply on a warm, sunny day when daytime temperature is above 60 °F and no rainfall is forecast for 24 hours. Warm, sunny weather will speed up weed control. Apply only when air is calm. If necessary, use cardboard or plastic to shield desirable plants. Reapply if it rains within 2 hours after application. Rainfall or watering 2 hours after application will not wash away effectiveness. Hard-to-control weeds (such as Bermudagrass) may require a repeat application if they regrow. See the COMPLETE LABEL for specific use rates, mixing instructions and detailed instructions. Do not use or store solutions of this product in galvanized steel or unlined steel sprayers, or apply through any type of irrigation system or with a sprinkling can. Rinse sprayer and flush all sprayer components with water 3 times after use. Spray rinse water on bare soil or gravel. After very thorough cleaning, sprayer may be used to apply other products. Close cap tightly after use. Concentrate Grass & Weed Killer 41% Glyphosate is an all-purpose weed and grass killer which will kill almost all plants it contacts. DO NOT use for spot weed control in lawns since Concentrate Grass & Weed Killer 41% Glyphosate kills all green plants, including lawn grass. If necessary, use cardboard or plastic to shield desirable plants. If plants are accidentally sprayed, rinse off immediately with water. Spray when air is calm. Spray to evenly wet the weed. 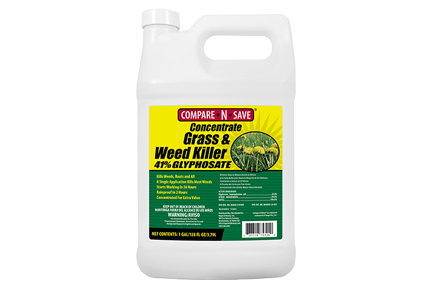 Concentrate Grass & Weed Killer 41% Glyphosate kills weeds by stopping the production of a substance found in plants that is needed for plant growth. Any Concentrate Grass & Weed Killer 41% Glyphosate not absorbed by the plant breaks down into natural materials. This product will not move in or on the soil to untreated plants. It is a violation of federal law to use this product in a manner inconsistent with its labeling. Read the entire label before each use. See the COMPLETE LABEL for specific use rates and detailed instructions. Consult the SAFETY DATA SHEET (SDS) for important safety information.